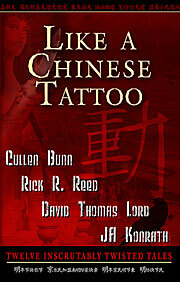 DarkArtsBooks » Like A Chinese Tattoo Reviews! Like A Chinese Tattoo Reviews! Like A Chinese Tattoo, Dark Arts’ April 2008 release featuring stories from Cullen Bunn, Rick R. Reed, David Thomas Lord and JA Konrath, has been garnering some great thumbs-up press this summer! Hellnotes heralded the launch in early April noting, “In typically atypical fashion, Dark Arts Books launched its fourth title, the obliquely named Like A Chinese Tattoo last week at the World Horror Convention in Salt Lake City by staging … what else? A late night Pajama Party. The book follows the press’ unconventional approach, melding extremely dark fiction with over-the-top humorous horror. Horrorview Review wrote, “Like a Chinese Tattoo is not for the squeamish. There’s plenty of creepy, crawly dead things (and dead parts, in some cases). The subject matter may shift from the macabre to the manic, but each story is delivered with gripping detail and devilish glee. For fans of the sick and twisted, this collection is a winner.“ To read the review in its entirety, click here. This entry was posted by admin on Thursday, July 24th, 2008 at 1:39 pm	and is filed under News. You can follow any responses to this entry through the RSS 2.0 feed. Responses are currently closed, but you can trackback from your own site.